Rubenerd: A hilarious Windows 7 beta report! A hilarious Windows 7 beta report! 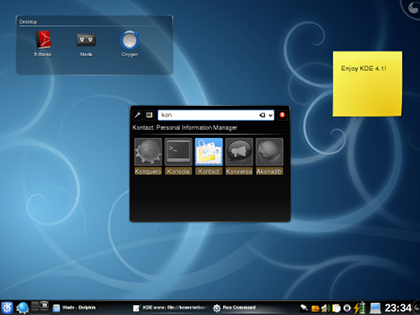 Screenshot of the current release of the KDE (Linux, FreeBSD etc) desktop. Wait, I mean Windows 7. Ina Friend over on CNET News is reporting that Microsoft has made beta versions of it's Windows 7 operating system available for download. Normally I would have yawned at such an announcement, but given I was waiting for my sister to get ready before we headed out for lunch, I figured I'd skim it. Microsoft has apparently decided that it has enough server capacity and has made the code available for the Windows 7 beta. The software was supposed to be made available on Friday, but the company delayed the release after a day filled with Web site problems. To be serious for a second though, I really do home Microsoft picks up the ball they dropped with XP and Vista. They won't of course, but for all the people in the corporate world who are stuck with Microsoft's subpar products (including my dad who I can hear swearing in the distance) I hope they at least make a sincere effort. Excuse me, I have to go laugh again!